This custom was made before Hasbro's Jedi Spirits 3-pack. 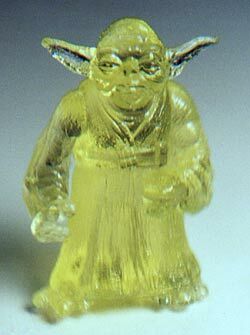 I made a two part mold of Yoda. POTF2 Yoda has a deep undercut on his left arm so before I poured the mold I built a layer of clay there, sort of joining the arm to the body. For the cast I used Kast-a-Kraft clear resin with green dye added. I have since made anther blue-green cast that matches the color of Hasbro's.